This Folding gas bottle cage gives a flexible solution which can be laid flat to make storage and transportation easier. The folding gas bottle storage cage includes a storage shelf to providing split storage which can be used for large and small bottles. 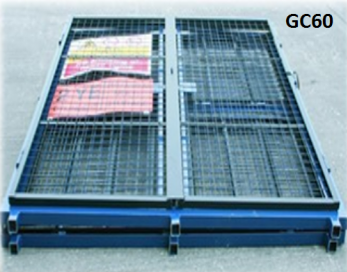 The Folding gas bottle storage cage is manufactured from 3mm thick Angle Steel section and 2'' square steel mesh and will accept 4 large ( 47KG ) and 8 medium ( 19Kg ) bottles. The Folding Gas Bottle storage cage is supplied flatpack with all necessary fixings with all Health and Safety Signage pre-fitted for your convenience and safety. All our Folding gas bottle storage cages are attractively paint finished in Blue with a pre coat applied to prevent corrosion and offer protection from all elements due to its resistance to damp conditions. Typical lead times for your free UK mainland delivery are within 5-7 days. Accepts 4 large ( 47KG ) and 8 medium ( 19Kg ) bottles. Supplied flatpack with all necessary fixings with all Health and Safety Signage pre-fitted for your convenience and safety. Paint finished in Blue with a pre coat applied to prevent corrosion and offer protection from all elements due to its resistance to damp conditions.